Cesar Fabian Ortiz-Fonseca - Spanish Lawyer, International Legal Consultant, Relocation Services, International Property - Dr. Claudia Ortíz Fonseca & Abogados, London, UK. Cesar Fabian graduated in law from the University Agraria de Bogotá, D.C., Colombia in 2013. Additionally, he undertook advanced studies of Business Administration at Universidad Javeriana Bogotá, D.C., Colombia (2000-2003). He has taken several courses on civil and criminal law, and he is currently in the process of obtaining his postgraduate degree as a specialist in Public Administration from the Advanced School of Public Administration - ESAP. 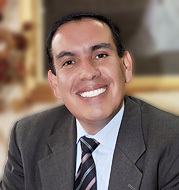 Cesar Fabian is an author of the legal article "Ley de las �Pequeñas Causas� como desacierto Legislativo". His professional career launched when he took the role of lawyer at Servicios Jurídicos Internacionales (2013- 2014), and he has been a valuable member of our firm since 2014. His professional practice and experience focus on civil and commercial law as well as litigation.